When will the iPhone 5 come to Australia? Apple has finally signalled its intention to unveil the iPhone 5 at a media event on Wednesday 5 October (Australian time), but when will Australians get their hands on Apple's newest creation? Apple has finally revealed the date it is expected to unveil its next-generation iPhone, the iPhone 5. The company sent out invitations to the media overnight for an event on Wednesday morning 5 October (Australian time). 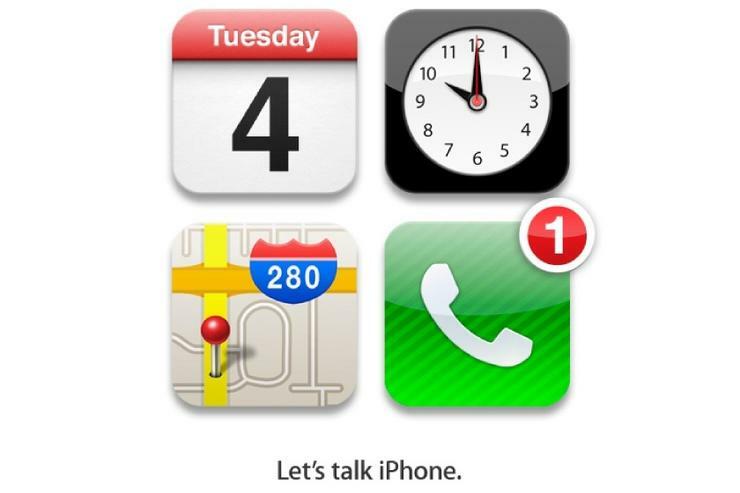 The invitation is simply titled "Let's talk iPhone". Read our comprehensive iPhone 4 review and check out our guide to the best upcoming smartphones in 2011. Though there is no clear indicator there will be an all-new iPhone unveiled at the event, it's highly likely considering Apple has released a new iPhone every year since the original hit US shelves in 2007. When is the iPhone 5 likely to be available in Australia? Traditionally, Australian consumers have had to wait a little longer than US residents to get their hands on the latest iPhone. As an example, the iPhone 4 launched in the US on 24 June 2010, but Australians had to wait until 30 July. Because no firm date has been announced all we can do is speculate, but we expect the iPhone 5 Australian launch to follow the pattern of the iPhone — it will most likely launch on a Friday and should follow a few weeks after the US launch. Some rumours have suggested Friday 14 October as a potential Australian release date, though this would likely mean that it launches at the same time as the US. Considering this date is just a week and a half after the media launch event we would guess it is unlikely. Friday 21 October or Friday 28 October seem like more realistic dates. Where will I be able to buy the iPhone 5 from? The iPhone 5 will once again be available from all three major telcos in Australia — Telstra, Optus and Vodafone. It should also be available on Virgin Mobile, just like the current iPhone 4. Like the current iPhone, the iPhone 5 should also be sold outright through Apple's Retail Stores, including the newly opened Penrith and Hornsby stores in New South Wales. Of course, the iPhone 5 will once again be sold through online store. Will there be more than one new iPhone? Many industry experts are predicting two new iPhone devices to hit the shelves this year. The first is likely to be an all-new, flagship iPhone 5 and the second an iPhone 4S — a slightly cheaper, downsized version of the iPhone 5 targeted at consumers on a budget. Most predictions suggest this could be a slight refresh of the iPhone 4 with a lower price tag. What is likely to be new in the iPhone 5? Rumours about the iPhone 5 have been published for months, some wild speculation, others sounding closer to the mark. At the very least, expect the iPhone 5 to have a larger screen, a better quality camera and a new design: Apple loves to make the claim that new products are thinner and lighter than their predecessors. What do you want to see in the iPhone 5? Are you likely to buy Apple's latest iPhone? Be sure to vote in our poll and let us know your thoughts in the comments section below! What is the one "must-have" feature you would like to see on the iPhone 5?